Click any of the links in the menu below for more information about that specific section of Home Branch. The &apos;Home&apos; section of Home Branch is your landing page when logging into Home Branch. Your Account Summary is viewable on this page and includes a brief summary of all your account suffixes with EFCU (Checking & Savings, Loans, and Credit Cards). The &apos;Checking & Savings&apos; section will show the account suffix number, description, balance, available funds, and dividends. A &apos;Loans&apos; section and a &apos;Credit Cards&apos; section will be visible if you have any loans or credit cards with EFCU, these sections will show the account suffix number, description, balance, available funds, amount due and a due date. To access more detailed information about each of your account suffixes, simply click on the suffix description (highlighted in blue). Mortgage and Mastercard payments are posted once daily on business days. Your summary balance may not reflect your most recent payment. You will also see any suffixes to which you have been granted access from other member&apos;s accounts on this page. Suffixes from member&apos;s other accounts are designated by the dark gray background. If you wish to prevent any account suffixes from being visible on this page, you may do so by selecting the &apos;Suffix Preferences&apos; link under the &apos;My Profile&apos; tab in the navigation bar. After clicking the account suffix description in the Account Summary section of Home Branch, a new page will open providing you with more details for that suffix. 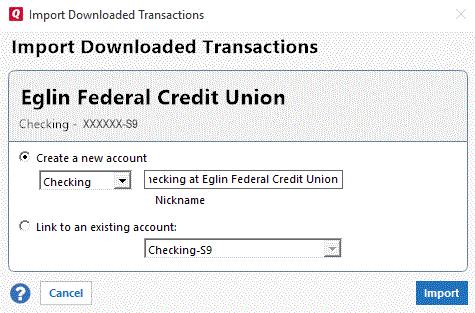 Checking & Savings: From the &apos;Quick Links&apos; menu you may select to edit preferences, transfer funds from another of your available EFCU account suffixes to that suffix, or request an EFCU teller check paid from that suffix to be mailed to you. Loans: From the &apos;Quick Links&apos; menu you may select to edit preferences or make a payment on your loan from one of your other available EFCU account suffixes. Credit Cards: From the &apos;Quick Links&apos; menu you may select to edit preferences, make a payment on your credit card from one of your other available EFCU account suffixes, or request an EFCU teller check paid as a cash advance from that suffix to be mailed to you (please note: finance charges will begin calculating on the day of the cash advance). Checking & Savings: Transaction history for EFCU Checking and Savings accounts will include the date of the transaction, the effective date of that transaction, a check number (when applicable), a brief description of the transaction, debit or credit amounts, and the resulting balance for that account suffix. Loans: Transaction history for EFCU Loans will include payment dates, a brief description of the payment, total payment made, amount paid towards principal, amount paid towards interest, and the resulting balance for that loan. Mortgage payments are posted once daily on business days. Your summary balance may not reflect your most recent payment. Credit Cards: Transaction history for EFCU Credit Cards will include the date of the transaction, a brief description of the transaction, amount paid to or from the card, interest paid on payments to the credit card, and the resulting balance on that card. Mastercard payments are posted once daily on business days. 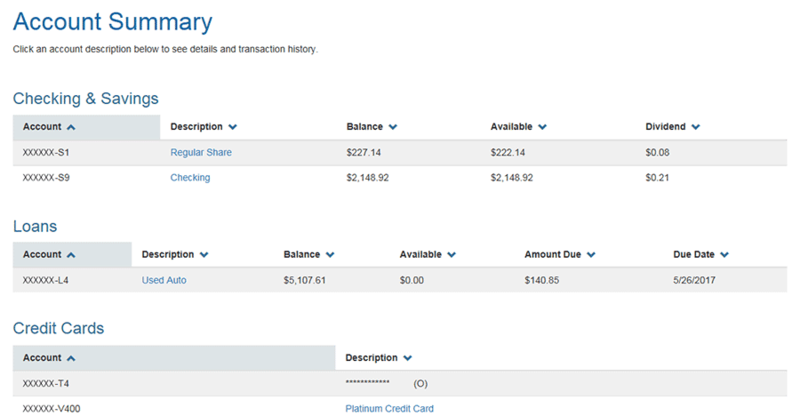 Your summary balance may not reflect your most recent payment. To view cleared checks: Cleared checks will be highlighted in blue in both the "Check #" column and the "Check Description" column, click the highlighted text to view details and check images. Items marked as "Check Converted to ACH Withdrawal" will not be linked since images are not available. An asterisk (*) by a check number indicates that the previous check number is missing from the sequence. 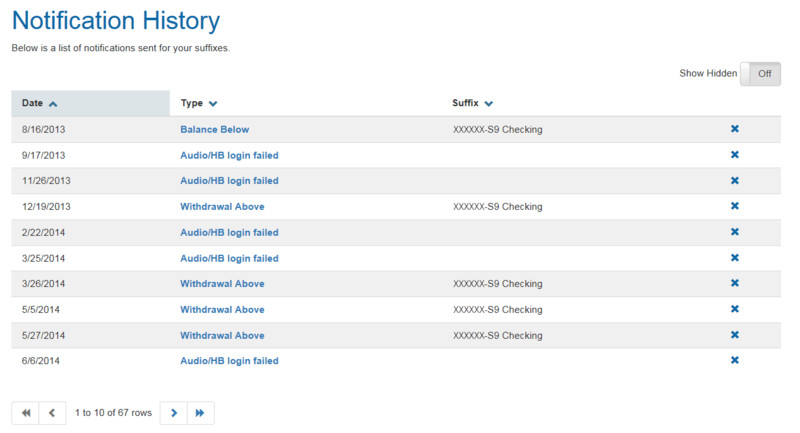 The holds tab will include information on any holds placed on transactions to or from your account suffix. Details include the date of the transaction, the date on which the hold will expire, a brief description of the transaction and the amount held. Quicken users, if you are experiencing difficulties connecting your account to Quicken, please click here. 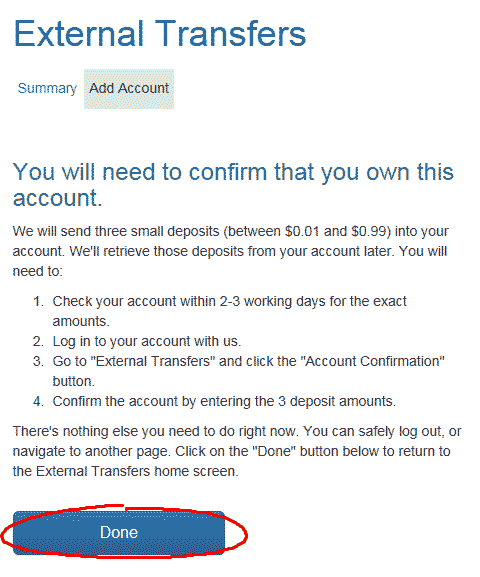 The Account Transfers page is located under the Transfers tab inside of Home Branch. On this page you may process a one-time transfer of funds between your EFCU accounts. Simply select the account suffix you are transferring the funds from, the suffix you are transferring funds to, the amount to transfer, add any comments you wish to document with the transfer, and select &apos;Submit&apos;. Monthly limits:There is a monthly limit of 6 transfers on all share accounts (Regulation D). The Member Transfers page is located under the Transfers tab inside of Home Branch. On this page you may process a one-time transfer of funds from your available EFCU accounts to another EFCU Member's account. In order to process a member transfer, you will first need to know the member's account number, suffix and first two letters of their last name. Select the account suffix you are transferring the funds from. Input the 5 or 6 digit account number of the other member. Input the suffix you are transferring funds to (for instance, to transfer the funds to a savings account, the suffix would be &apos;S1&apos;). Input the first two letters of the last name of the member whose account you are transferring to. Input the amount you wish to transfer. Add any comments you wish to document with the transfer. Select &apos;Submit&apos; to complete the transaction. The Scheduled Transfers page is located under the Transfers tab inside of Home Branch. On this page you may schedule one-time or recurring transfers of funds to and from your available EFCU accounts, including your EFCU Mastercard. Options for frequency of scheduled payments include once, daily, weekly, biweekly, semi-monthly, monthly, bimonthly, quarterly, semi-annually and annually. Select the account suffix you are transferring the funds to. Select the frequency of the transfer from the dropdown list. Select the date you wish the scheduled transfers to begin on. If scheduling a one-time transfer, select the date you wish the transfer to occur on. Add any comments you wish to document with the transfer(s). Select &apos;Submit&apos; to finish setting up your scheduled transfer. Connect to your external checking accounts and make payments to your EFCU loans and credit cards with this feature. Please note: You MUST have an established EFCU credit card or loan for this option to be made available to you. 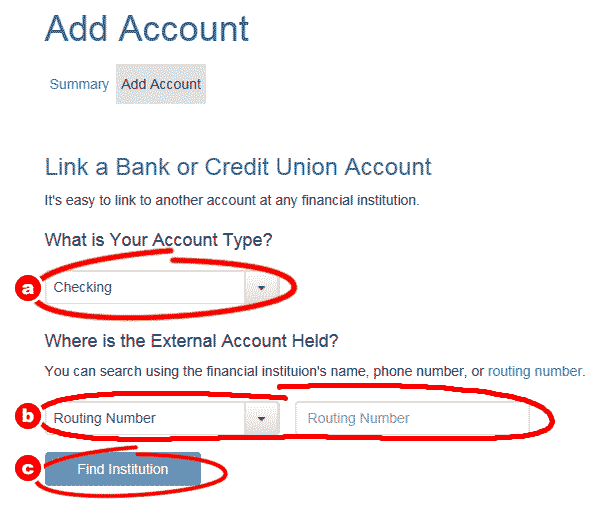 To begin you will need to establish a connection to your account(s) at your other financial institution. 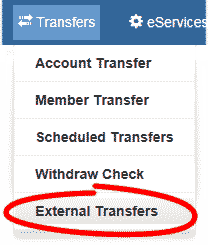 Log into Home Branch and select "External Transfers" under the "Transfers" tab on the main navigation inside of Home Branch. When you first visit the External Transfers page, you will not have any active accounts listed. To connect your accounts from other financial institutions, select "Add Account." After you have entered the routing number or phone number select "Find Institution" (c). After clicking "Find Institution" you should see your financial institution's information on screen. If it is not the correct institution, please check the information you input and select "Find Institution" again. Once you are satisfied you have the correct financial institution information selected, you may a choose a name for the external account (a) and will need to input your account number (b) before selecting "continue" (c). Once you have completed adding the account, it will be pending verification and a new screen will open explaining the process for verifying the account. Note: You will not be able to use these accounts for external transfers until you've received and verified the three deposit amounts. You will receive three small deposits into your external account within 2-3 business days. Once recieved, you will need to log into Home Branch and navigate to the External Transfers page again. At this point you should see the account listed, select "Click to Verify." 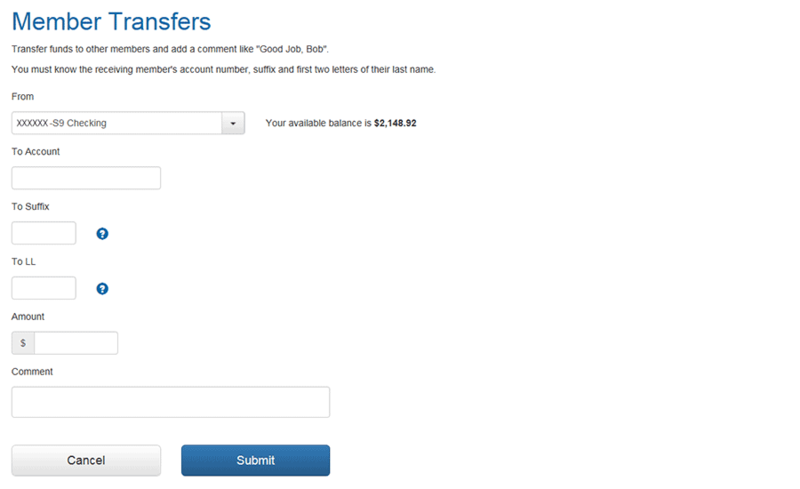 You will then be prompted to input the three amounts received into your other account. Once you have done so, click "Confirm." Once you have succesfully completed the verification process, your external checking account will be listed on the external transfers page and you can then request transfer of funds from that account to your EFCU credit card or loan (external transfers to your EFCU mortgage are not currently available). To set up an external transfer, click "Request." After selecting "Request" a page labeled "Request Money" will open. 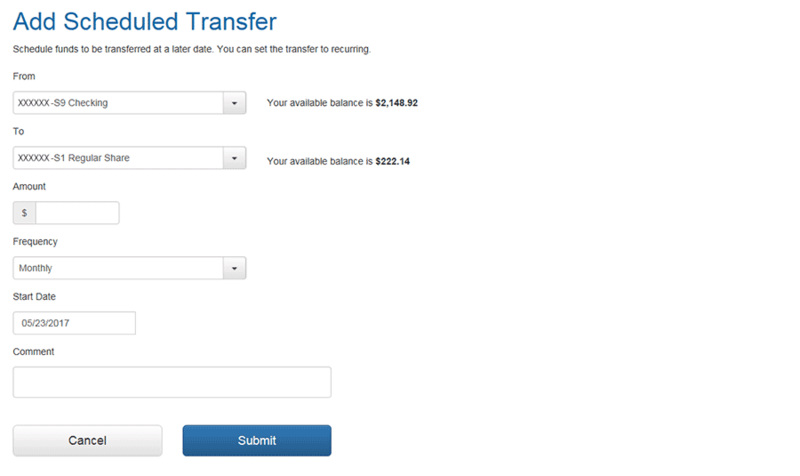 On that page, under "From," select the external checking account you intend to transfer funds from. Under "To," select the EFCU loan or credit card you want to transfer the funds to. 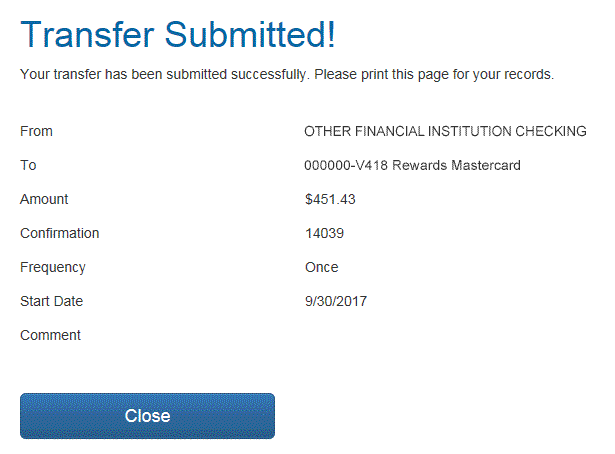 Enter the amount you wish to transfer under "Amount." External Transfers can be set up as recurring or one-time payments. To set up a one-time payment, select "once" under "Frequency." To set up a recurring payment, choose one of the other options from the "Frequency" dropdown menu. Once you have completed the above steps, select a date you wish your one-time payment to occur on or your recurring payments to begin on. A comment section is available to add any notes or comments for your own reference. Once you have completed the sections on this page, select "Submit." After selecting "Submit" a page labeled "Confirm Transfer" will open. Review the settings you selected for the external transfer for accuracy, read the "ACH Origination Terms and Conditions Agreement" and select "Confirm" if the information is accurate and you agree to the terms and conditions. 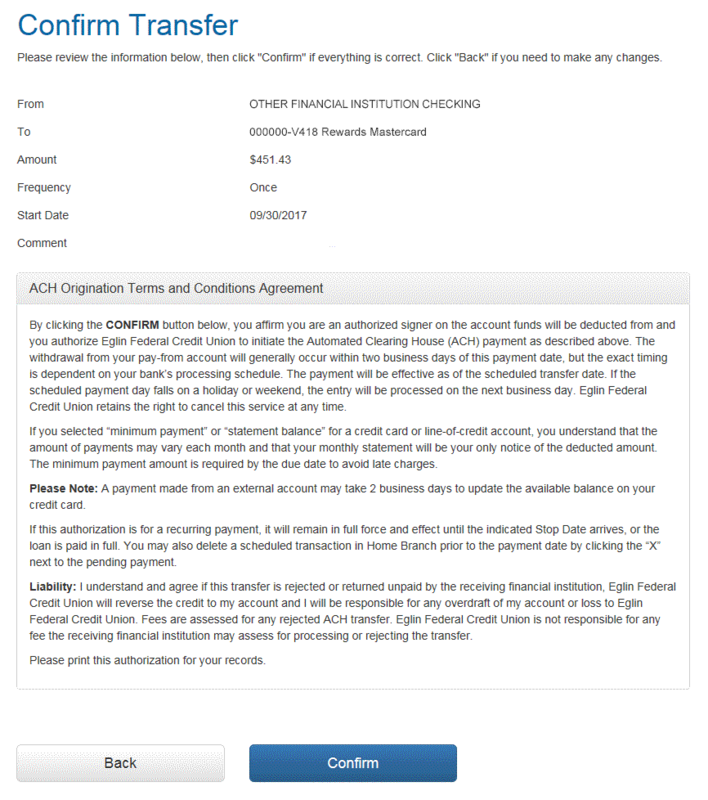 After selecting "Confirm," the next page should confirm the transfer request has successfully been submitted and will provide a summary of the transaction settings. You may print this page for your records and, when you are done, select "Done." After completing the above steps you will be returned to the "External Transfers" page and a new section labeled "Activity" should be visible. Any external transfers you have set up that are currently active will be listed here. Alerts allow for you to set up balance level inquiries, reminders for payments, account warnings for logins or account updates and much more. The main "Alerts" page, located under the "eServices" tab in Home Branch, will show the list of alerts you currently have set up and includes buttons to add a new alert and to view your alerts notification history. Please be sure to verify that the email address you have on file is the location where you would like password resets, username requests and alerts on your suffixes to be sent. This email address can be updated through the My Profile link. To set up a new alert: Click the "New Alert" button, on the following screen select the type of activity and the suffix you wish to receive alerts for, input any other information requested based on the alert you choose (for instance, if you choose "Loan payment due soon" as the type of alert, a field for "number of days" will become available), and click "Save". When triggered, an alert notice will be sent to the email address you have on file. To modify an alert: Some alerts such as "Balance below" and "Withdrawal above" will allow for you to adjust parameters, on the main "Alerts" page, these alerts will be highlighted in blue in the column labeled "Type." Click the highlighted text to make changes to these types of alerts. To delete an alert: From the list on the main alerts page, simply click the "x" to the right of the alert which you no longer wish to use. Notification History: Clicking "Notification History" will open a page showing the date, alert type, and suffix for all of your triggered alerts in chronological order. Clicking the highlighted blue text will reveal detailed information regarding the trigger event. A button is also provided to show or hide suffixes you have selected to be hidden in "Suffix Preferences." Bill Payer allows you to schedule as many one-time or recurring payments as you like up to a year in advance, free with a minimum of 3 transactions monthly. Scheduled payments may be added, removed, or edited at your convenience. If you are already signed up for Bill Payer: This link, located under the "eServices" tab in Home Branch, will connect you to your Bill Payer account. If you have not signed up for Bill Payer: This link will open the Terms & Conditions Agreement for Bill Payer, at the bottom of which will be a choice of buttons to either "decline" or "accept." Be sure to read the complete Terms & Conditions Agreement for Bill Payer prior to accepting the Terms & Conditions of the service. If you choose to accept, you will then be redirected to Bill Payer where you will be able to set up payees and scheduled payments. Please note: If you are having difficulty accessing Bill Payer, you may need to add https://eglin.ns3web.org/ as a trusted site in your browser settings. If you still need assistance, please contact our Member Services Department at 850.862.0111 and select option 4. To Learn more about Bill Payer take a moment to view the Bill Payer demo. Click here to review the Terms and Conditions & Agreement for Bill Payment Service. eStatements provide online access to your account statements instead of by mail. Besides being an excellent way to help our environment, going paperless is a fast, convenient and safe way to view your monthly statement. This service is free to all EFCU members and can be set up or cancelled at any time inside of Home Branch. Turning on eStatements will convert the delivery of ALL your EFCU statements from paper mail to digital access via Home Branch. If you are already signed up for eStatements: Clicking this link, located under the "eServices" tab in Home Branch, will open a page revealing a list of your eStatements going back one year. To view your eStatements, click on the date in the list (highlighted in blue). 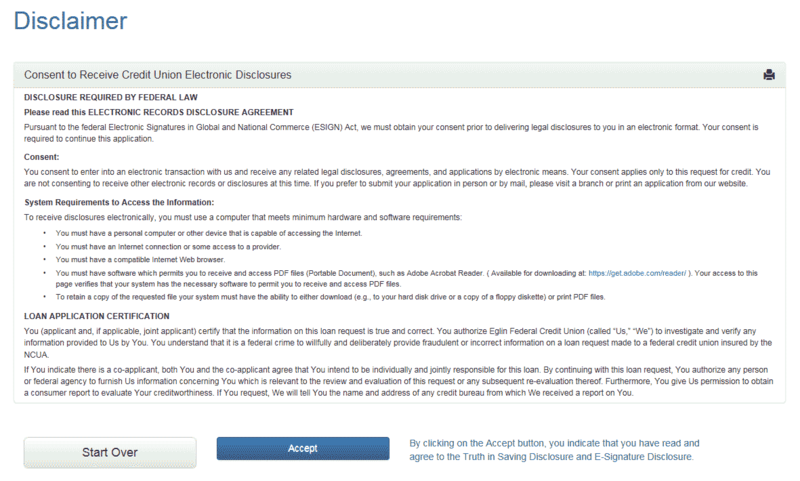 If you are not already signed up for eStatements: Clicking this link will open the eStatement Agreement & Disclosure, at the bottom of which will be a choice of buttons to either "decline" or "accept." eStatements will be provided to you instantly after agreeing to the eStatement Agreement & Disclosure within Home Branch. Please note: You will need Adobe® Reader and your browser will need to accept session cookies from esolutions.pinnacledatasystems.com to view your eStatements. All initial Deluxe Check Orders must be placed at a branch or over the phone at 800.367.6159 option 2. After clicking "Reorder Checks," located under the "eServices" tab in Home Branch, you will be prompted to select the suffix you wish to reorder checks for from the "suffix" dropdown. Make a selection and click "Select," from there you will be redirected to the Deluxe® website where you will complete your check reorder. The tax information page, found under the "eServices" tab in Home Branch, provides you with a quick summary of your interest information. By default, this page will show the current year, to view the previous year, click the button labeled "Previous Year." 1. Click the "Loan Application" button under the eServices tab. A disclaimer will open on the next page, please read the disclaimer and select "Accept" to move forward. 2. On the following page, labeled "Select a Loan," you will be prompted to choose whether you are applying individually or jointly and to choose the type of loan or credit card you are applying for. Depending on your selection, you will then be prompted to input more information regarding your loan request. Click "Next" once you have made your selections and completed all fields. 3. 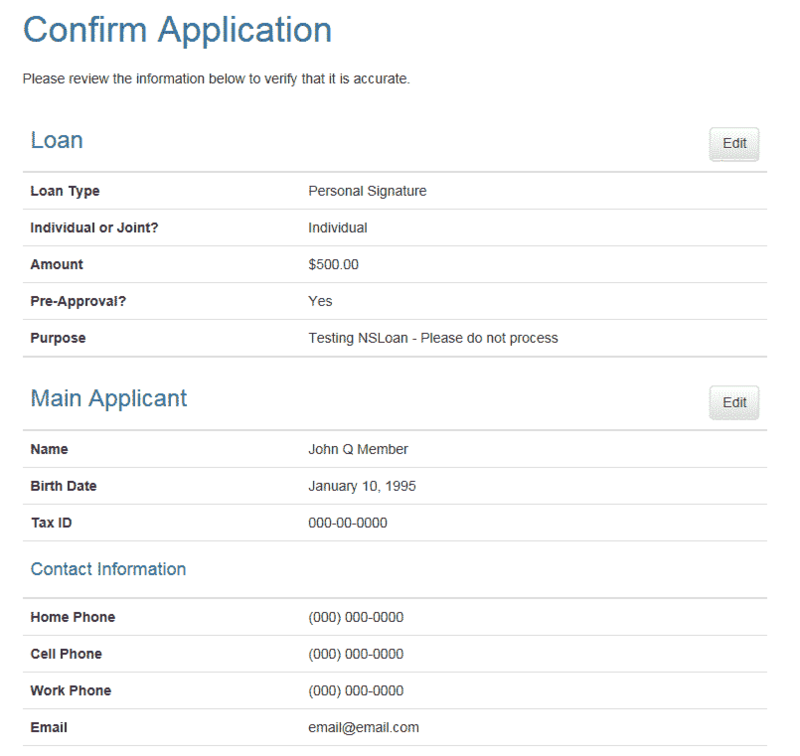 The next page, labeled "Applicant Information," will have some of your personal information pre-loaded into the fields. Please fill in the remaining required fields and select "Next" to continue. 4. The following page consists of a summary of your loan request. You may select "edit" to make any changes prior to sumbitting the application. When you are ready, select "Submit." Success! After clicking "Submit" your loan request will be delivered for processing and the following screen will provide a confirmation number and some information regarding the loan process. An email will also be delivered to the email address you have on file. 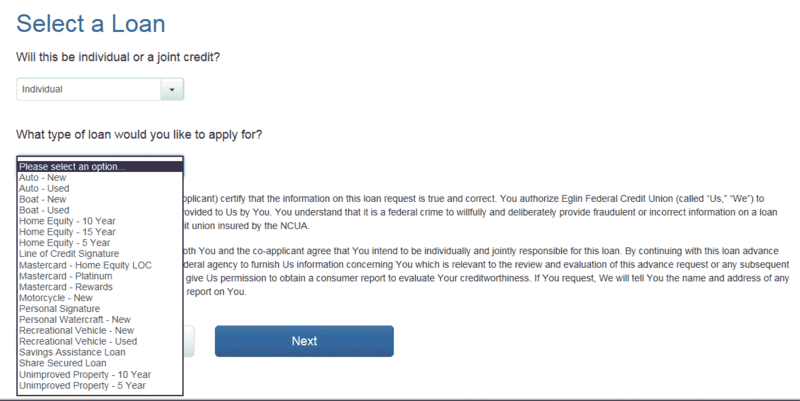 The message center provides a secure means of documented communication between you and Eglin Federal Credit Union. View and respond to conversations by clicking the subject title, highlighted in blue. To begin a new conversation, select "Start a new conversation," enter a subject, compose a message and select "Send." Once your message has been delivered, an EFCU Representative should provide you with a reply within one business day. Clicking "Phone Numbers" will open our "Contact" page in a new tab. Here you can find phone numbers for the various EFCU branches and departments. Additionally, you may send us a secure email by using the "Secure Email" section located on this page. 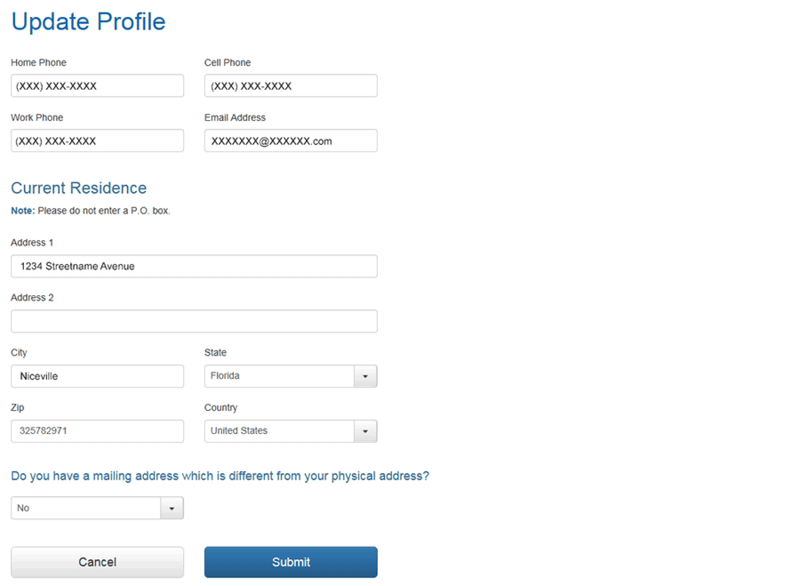 The "Contact Information" page, located under the "My Profile" tab inside of Home Branch, allows you to update your email address, physical & mailing address and phone numbers online. Please be sure to verify that the email address you have on file is the location where you would like password resets, username requests and alerts on your suffixes to be sent. To make your online banking experience more secure, we recommend using a nickname instead of your account number as your Home Branch login username. To change your username, simply log in to Home Branch, select "change username" under the "My Profile" tab, enter the username you wish to use, re-enter the username to confirm and select "Submit." If you believe there is any chance your Home Branch password has been compromised, we recommend changing it immediately. Even if you do not feel there is a risk, it is good practice to routinely change your password. To do so, select "Change Password" under the "My Profile" tab inside of Home Branch, enter your old password, enter a new password, re-enter the new password to confirm and select "Submit." Passwords must not contain your primary account number, SSN, full name or phone number. For tips on creating a strong password, please read the "Strong Passwords" article inside the "Tips for Staying Safe Online" section on the Safety and Security page of our website. 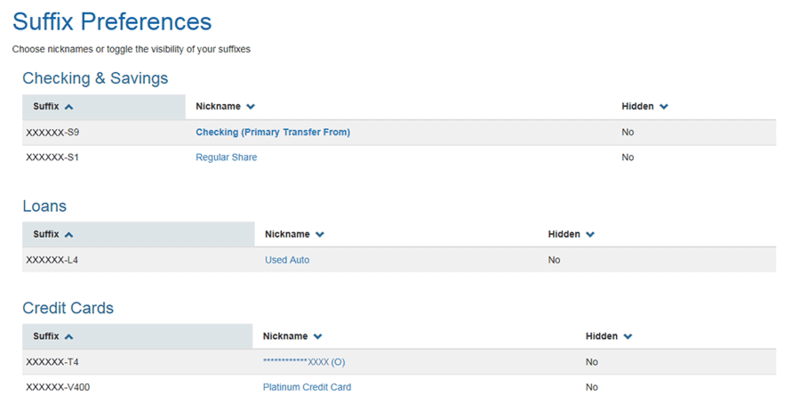 The "Suffix Preferences" page, located under the "My Profile" tab inside of Home Branch, allows you to create and change nicknames for each of your account suffixes, toggle their visibility on the home page of Home Branch and select a primary account that your transfers be paid from within Home Branch. To manage preferences for a particular suffix, simply click on the highlighted blue suffix in the "Nickname" column. Courtesy Pay for Debit POS Transactions is a service available on Premium Checking accounts that may cover insufficient fund items on debit card purchases and point-of-sale (POS) transactions. Learn more and view the Courtesy Pay disclosure. To establish Courtesy Pay for Debit POS Transactions, please visit the Applications & Forms page on our website, select the "Opt-In/Out: Courtesy Pay for Debit POS Transactions" link, fill in the fields and select "submit" to continue the application process inside of DocuSign. Once you have established Courtesy Pay, you may use the on/off switch on the Courtesy Pay page, located under the "My Profile" tab inside of Home Branch, to set your overdraft preferences for your EFCU Debit Card. Please note: In order to Opt-In for Debit POS Transactions to be covered, your account must already be enrolled in Courtesy Pay. To verify, please contact Account Services at 800.367.6159 x.1402. Correcting issues connecting to EFCU online services. If you are having trouble accessing any of our online services (Home Branch, Bill Payer, eStatements...), it is possible they are being blocked by security software and plugins on your computer. a. Select "Internet options" under the tools menu at the top left of your browser window. b. In the "Internet options" window that opens, select the "security" tab. Under the security tab, click the "Trusted Sites" icon and then click the button labeled "sites." 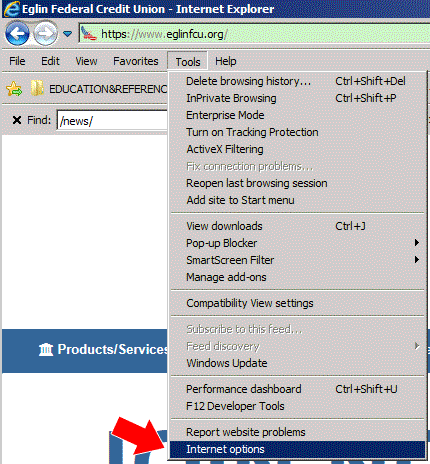 c. In the "Trusted Sites" window, input https://eglin.ns3web.org/ and click "add." Repeat this for adding https://www.eglinfcu.org, https://olb.deeptarget.com and https://www.billpaysite.com/. Once you have completed adding these sites, click "close." Be sure to click "Apply" and then "OK" on the "Internet Options" pop-up to save your settings. a. 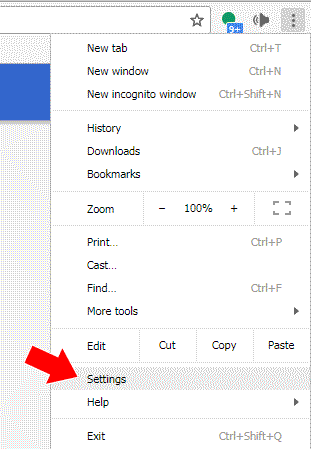 Open the Chrome menu by clicking the menu icon (three vertical dots) in the top right corner of the browser window. In the Chrome menu, select "Settings." b. In the Chrome Settings window, scroll to the bottom and click "advanced." More options will populate below the "advanced" link, continue scrolling all the way to the bottom until you see the section labled "System." Click "Open Proxy Settings." c. A pop-up window labeled "Internet Properties" will open, select the "security" tab if it is not already selected. Under the security tab, click the "Trusted Sites" icon and then click the button labeled "sites." d. In the "Trusted Sites" window, input https://eglin.ns3web.org/ and click "add." Repeat this for adding https://www.eglinfcu.org, https://olb.deeptarget.com and https://www.billpaysite.com/. Once you have completed adding these sites, click "close." Be sure to click "Apply" and then "OK" on the "Internet Properties" pop-up to save your settings. a. 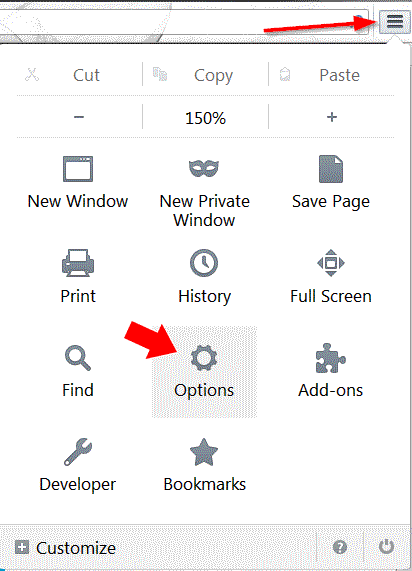 Open the Firefox menu by clicking the menu icon (three lines stacked vertically) in the top right corner of the browser window. In the Firefox menu, select "Settings." b. In the Firefox Settings window, select the "security" tab fromt he left-hand navigation menu. On the "Security" settings page under "General," click "Exceptions." 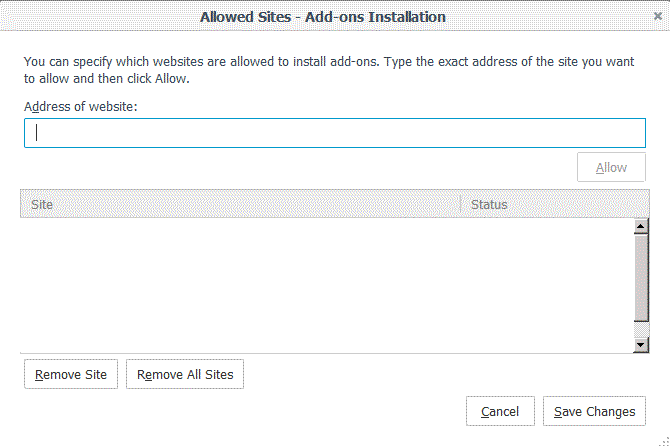 c. The next window is labeled "Allowed Sites - Add-ons Installation." 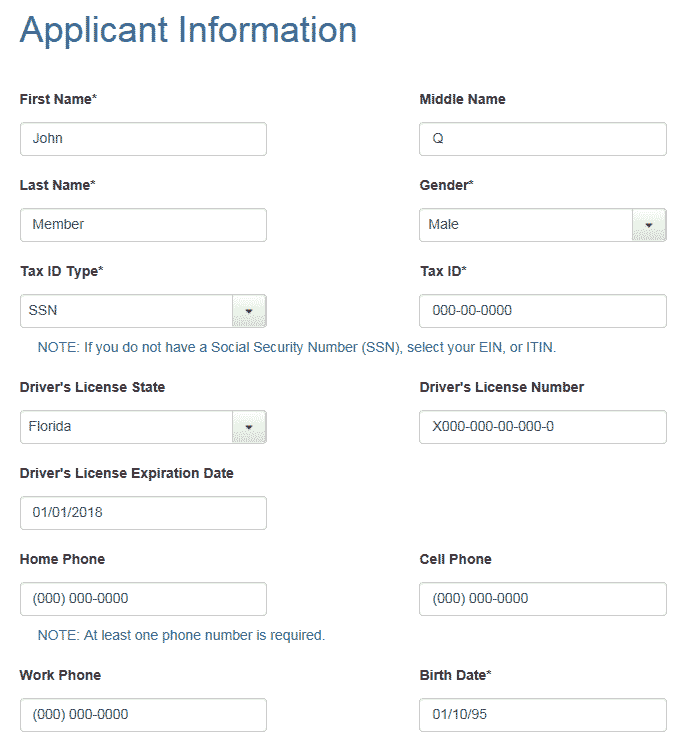 Input https://eglin.ns3web.org/ and click "allow." 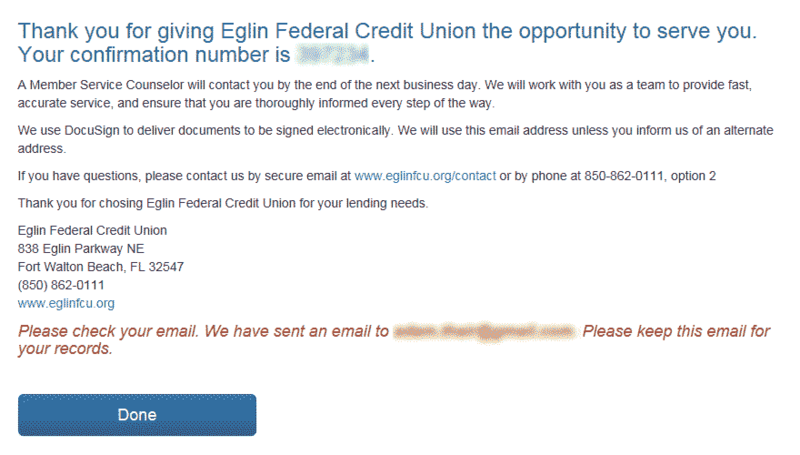 Repeat this for adding https://www.eglinfcu.org, https://olb.deeptarget.com and https://www.billpaysite.com/. Once you have completed adding these sites, click "Save Changes." Safari users: If you on a Mac computer and using Safari, you will want to add these sites to your "Top Sites" list. Instructions for doing so are listed on Apple's website located here. There are numerous internet browsers available and we cannot provide instructions for editing Trusted Sites in all of them. If you are using a different browser than the ones listed above, we recommned doing an online search for instructions on how to add sites as exceptions to their security. 2. In addition to adding our sites as exceptions to your Internet browser's security, we recommend adding these sites as exceptions to any ad-blocking, pop-up blocking, anti-virus, anti-spyware, and anti-malware software or plugins you have installed. 1. Open Quicken and press the Ctrl + A key and this will bring up the account list. In this window you will see all the accounts that are configured in Quicken. You will see an "Edit" button to the right of each account. 2. Click on the "Edit" button. This opens a new window with tabs on the top. They are "General", "Online Services" and "Display Options." Click on the "Online Services" tab and select "Deactivate." 3. After clicking "Deactivate," you will be prompted to select "Yes" or "No." Click "Yes." Now one step update should be turned off. 4. Once you have deactivated one step update, log in to Home Branch and manually download your accounts into Quicken. To do so, for each account you wish to link to Quicken, open the account details and select "Quicken (QFX)" from the dropdown at the bottom right corner of the page and click "Download." 5. After clicking "Download," you should see a box asking to link or create a new account. Make sure you select "Create a new account" and choose the correct account type from the dropdown menu before clicking "Import." 6. You will need to repeat steps 4 and 5 for each account you wish to have setup in Quicken. 7. To turn Quicken One Step Update back on, click on the Set up now button. This will bring up a window asking for your username and password. (Please note, if you are still using your account number as your username, you should input your exact 5 or 6 digit account number with no leading zeros.) Follow the steps to finish activation. If you have your payment(s) setup with a bill payer service or another financial institution, you will need to update/add the above payee information for submitting payments to your EFCU Mastercard. You can now set up payments from another financial institution to your EFCU Mastercard using the new External Transfers feature inside of Home Branch. Click here to learn more about this new feature.